Question: Do Restylane injections hurt? Can you get anesthesia or some type of sedation if you have a fear of needles? You can have restylane injections with some sedation but this is not a very common request. Oral sedation is a consideration. The question of whether it hurts is “yes” there are variable amounts of discomfort and this is dependent on the approach, the type of local / regional anesthesia, how it is done, whether the filler has local anesthesia contained within it, whether the doctor uses topical anesthesia as well. On our webpage that can be found under procedures > facial fillers > fillers learn more. We cover the different types of anesthesia for fillers choices that you can choose from. 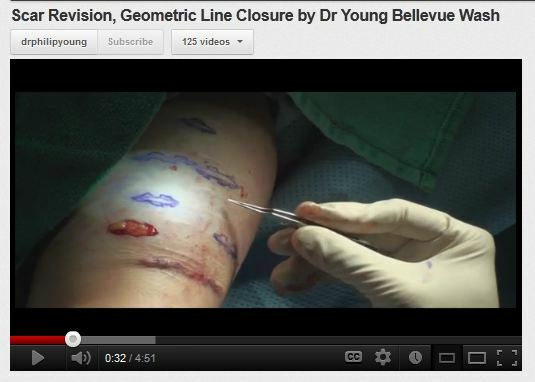 Deep scars are hard to reverse with fillers, excision and fat injections can work. This is in my experience. Sometimes you are able to get some improvement with fillers. But what I’ve experienced is that the filler tends to be injected in the surrounding areas and not where you want them which is under the scar. You really have to break up the scar tissue that has accumulated under the depression and this needs to be released. Once release you can fill it with fillers or fat. What I like to do is undermine the depressed area with different instruments and then fill it with fat. This however will not improve any surface details / qualities like incisions or lines there. The only way to improve that is to actually excise this type of scar. I would really need to see a picture of the scar or the scar in person to better figure out a way to improve it. Sometimes with the scar revision, you need to go under the skin to really release the collagen bands of scar tissue to alllow the skin to relax. Then more fat grafting or some filling may still be needed. You can always email me a picture if you would like more details. Since you inject radiesse deeper do you have less bruising than compared to restylane? Bruising with radiesse and restylane really depends on the technique. Yes if things are placed deeper, there is less visibility for the most part. Since radiesse is in general placed deeper it seems to have less bruising. But it really depends on a lot of factors like genetics of the patient, whether they have been on blood thinners, whether local anesthesia was used which can increase the bruising. Posted in Fillers / Facial Fillers, Juvederm, Perlane, Radiesse, Restylane, Sculptra | Comments Off on Since you inject radiesse deeper do you have less bruising than compared to restylane? How do I prepare for a filler and what kind of post care should I think of after a filler? 2. Use topical anesthesia first and then inject. This is a good option. The topical makes the skin numb, you may feel the injection go into the deeper layers. But like ice, it will feel like a stick in the new area and then get better with subsequent injections. 3. Local anesthesia and regional anesthesia, so called “dental blocks” to numb the nerves that innervate specific regions. This is the best way to make it so that you don’t feel anything. For some it is over doing the anesthesia. Sometimes, people who get anxious can get reactions to the local anesthesia and you can get an anxiety situation where your heart rate goes up as well as your blood pressure. This happens about 1 out of 25o times a filler gets done with local / regional anesthesia. After the filler, you should ice the area especially for the first 48 hours. I usually suggest 10 minutes for every hour. I also stress that you should not have the ice directly on the skin but have a barrier to prevent damage to your skin. This icing will keep the swelling down and also the bruising to a degree. For the first two weeks, I usually suggest people to massage the area of the filler if there are certain areas that are more elevated and pronounced than the other areas. Most of this uneveness if it is present will be improved with this. When the filler is in the lower eyelid area, you need to pull down the swelling over the bone and then massage it from there to effect it. After the first two weeks, I then suggest to consider more massage if the elevations are subtle and if large then you can consider enzyme injections or hyaluronidase injections which are very potent in reducing unwanted swelling from filler. Now with radiesse there is no enzyme that will do the same and you have to just massage the area to make it go down to a point that you like. Posted in Fillers / Facial Fillers, Juvederm, Perlane, Radiesse, Restylane, Uncategorized | Comments Off on How do I prepare for a filler and what kind of post care should I think of after a filler? Can fillers like restylane cause blindness if injected into the tear trough? Fillers (like restylane, perlane, radiesse, juvederm by Dr Young in Bellevue near Seattle, WA) in the tear trough can theoretically lead to blindness but there are precautions that you can take to prevent it. The veins around your eyes and nose and center of the face are valveless and do not prevent particles from traveling back into the deeper tissues like your eyes and brain. It is possible to cause the particles that are injected with fillers to go back into the eye to cause blindness. But this is extremely rare. You can take some precautions to prevent this though. When you inject, you should not apply to much pressure with injecting. Also when you inject it you should never be in one place and your needle should always be moving and distributing the filler evenly. This prevents a load of filler being place in one spot and in the case that you are near a vessel the one spot is not being filler aggressively and possibly back into deeper structures like your eye. Also local anesthesia prevents the vessels from being injected by constricting the vessels so that it is less likely for the filler to get into the vessels. This is a video on fillers around the eyes. Posted in Blepharoplasty / Eyelift / Eye Lift / Dark Circles / Eye Bags, Fillers / Facial Fillers, Juvederm, Perlane, Radiesse, Restylane | Comments Off on Can fillers like restylane cause blindness if injected into the tear trough? I have a line on my cheek and I was wondering what kind of cheek lift or filler I can use. 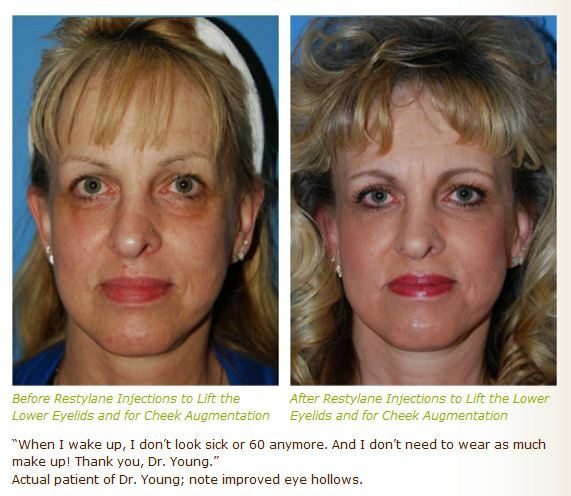 You can inject both Restylane or Juvederm (Dr Young is a filler expert in Bellevue Washington)in your cheeks. They are both very safe when injected by someone with experience. There are some differences in both of them. Restylane has been approved for 6 month duration and juvederm for 9 months. I think they are about the same in terms of length of duration in my experience ranging from 6 months to a year. One thing to realize is the Restylane comes in 1.1 milliliters or cc’s and Juvederm comes in about 0.8-0.9 ml or cc’s. You get a little more restylane than juvederm. Some people think that Juvederm is smoother and results in less lumps but I think that hasn’t been the case for me. The great thing about Juvederm, Restylane, Perlane is that you can mold these products a bit and if after 2 weeks you have some augmentation that you don’t like you can always inject some enzymes into the areas to decrease the amount of augmentation to get the very best results. Posted in Fillers / Facial Fillers, Juvederm, Perlane, Radiesse, Restylane | Comments Off on I have a line on my cheek and I was wondering what kind of cheek lift or filler I can use. Do non surgical cosmetic treatments really work? Options for non surgical cosmetic treatments include: lasers, fillers, sun avoidance, topical skin treatments, etc. All of these modalities have proven to show improvements in a person’s aesthetics. Lasers can non surgically remove sun spots, tighten your skin, reduce vascularity and red spots, improve skin texture. Fillers, can fill volume loss in your face which is actually the culprit of most of the aging that we experience as the years go by. Sun avoidance decreases the aging of your skin that occurs when your skin is exposed to sun. The UVA and UVB light can cause DNA mutations in your skin cells that cause aging and also can lead to skin cancer. Skin treatments which can include microdermabrasion, topical creams, facials, chemical peels that can be done in office and at home can all lead to skin rejuvenation. Skin treatments can tighten your skin to a degree, decrease unwanted pigmentation, speed skin turnover to rejuvenate your skin on a daily basis and prepare you for significant treatments. Another in between option is the YoungVitalizer (Dr Young who is in Bellevue, Washington discovered the YoungVitalizer). This is a procedure that I invented that entails volumizing your face with your own tissue. As we age we change from a grape to a raisin and using your own tissues to volumize your face can make your face look more like a grape instead of a raisin with the wrinkles and loss of the curves. Most traditional procedures change the aged raisin to a smaller raisin. You end up, often times, looking like someone else instead of the youthful grape you used to look like when you were younger. Posted in Fat Transfer / Fat Injections, Fillers / Facial Fillers, Intense Pulse Light, Laser Resurfacing, Perlane, Radiesse, Restylane, YoungVolumizer | Comments Off on Do non surgical cosmetic treatments really work? What is the best treatment for laugh lines? Fillers or Botox? Juvederm is commonly used for laughl lines as well as botox. It is important to know what you mean by laugh lines. Many refer to these as the lines around the eyes, or crows feet. Others mean when the say “laugh lines”, the lines around their mouths or nasolabial folds. I have a blog that defines those areas if you are interested to know the terms. But the nasolabial folds are the folds that run from the nose along the sides of the mouth. Whereas the lines below the mouth on the sides are commonly refered to as the marionette lines or puppet lines. The crows feet can be improved by botox and they can also improve the nasolabial folds to some extent. Fillers like juvederm can also fill in the nasolabial folds, marionette lines and also help with the crows feet. In order to really understand how they work a visit to a facial plastic surgeon would be helpful. Now the difference between fillers and botox is that fillers replace volume that is lossed during aging. When you lose volume there is an excess amount of skin compared to the underlying tissues. More skin for a set amount of volume leads to more folding of the skin and hence more wrinkles. Fillers replace that volume and hence fill in the skin and thereby decrease the ability for the face to make wrinkles. Botox, which is a neuromuscular agent can make the muscles less likely to contract. Hence they are most beneficial for dynamic wrinkles, or the wrinkles that are caused by muscular activity. Posted in Botox, Dysport, Botulinum, Fillers / Facial Fillers, Juvederm, Perlane, Radiesse, Restylane, Wrinkle Treatment | Comments Off on What is the best treatment for laugh lines? Fillers or Botox? Rhinoplasty (Seattle) requires careful analysis during the preoperative stages. You need to know exactly what you want to correct and hence having the unaltered preoperative state is essential with rhinoplasty. If the perlane that you have in the nose and bridge makes a big difference it would be prudent to dissolve the perlane with hyaluronidase. This will allow you the ability to see the native anatomy better and hence your surgeon can come up with an accurate plan. If it does not make a big difference the preoperative analysis may not be that affected. If the perlane with in other larger areas of the face where the impact would be less, the need to remove the perlane would be less necessary.